Happy Holi to all those celebrating it around the world. 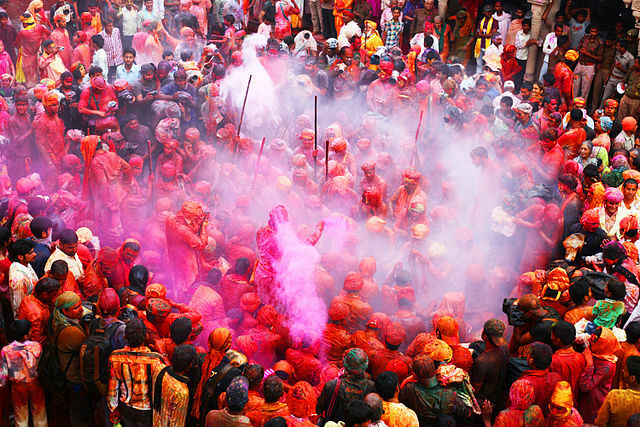 Today is Holi, a Hindu festival of colors that heralds the dawn of spring. This happy and riotous festival is celebrated on the last full moon day of the winter and is marked with people playing with colors. Holi is about the triumph of good over evil and also a celebration of love. Holi is a celebration of the story of Prhahalada and the love story of Krishna and Radha. Check out the colorful Holi images from The Guardian and Mashable. And here is wonderful clip from the film “Radhe Radhe: The Riots of Holi” by Prashant Bhargava with music by Vijay Iyer.